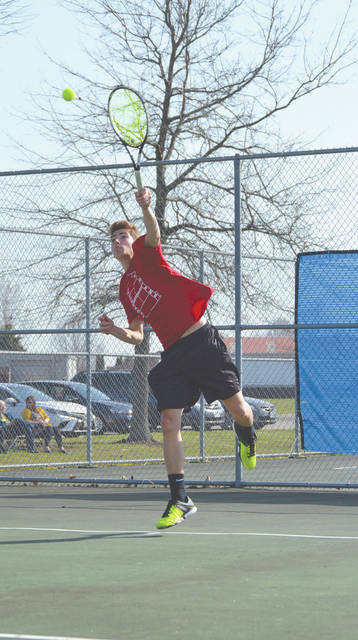 Ben Heath, the 2017 Ohio Heritage Conference Player of the Year, needed three sets to defeat Greeneview’s Matt Hovan on April 12 at Jamestown’s Seaman Park in first singles. Cedarville’s Colton Lewis was strong in a straight-set win over Greeneview’s Darian England, April 12 at Seaman Park in Jamestown. 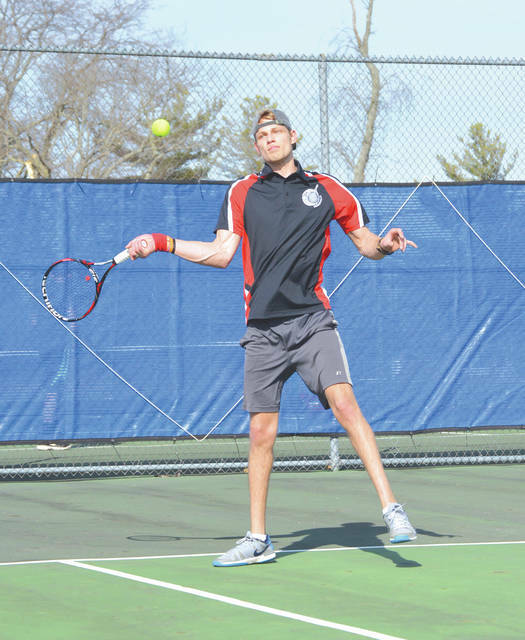 At third singles, Jate Bradley of Cedarville claimed a straight-set win over Greeneview’s Lane Hilderbrand, April 12 at Seaman Park in Jamestown. After losing the first set, the Greeneview No. 2 doubles tandem of Grant Callaway (right) and Emil Neer rallied to a three-set win over Cedarville’s Emeline Reed and Noah Myers, April 12 in an Ohio Heritage Conference tennis match at Jamestown’s Seaman Park. 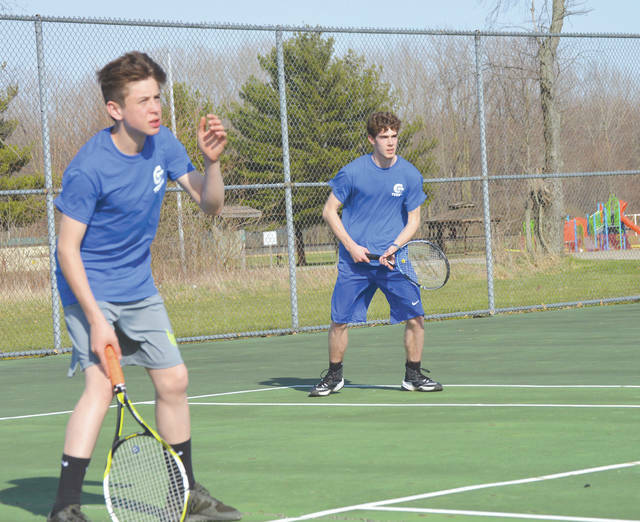 In the longest match of the day, the Greeneview first doubles duo of Mason Link and Hunter Grim earned a three-set win over Cedarville’s Nick Shaw and Ethan Leisure in boys high school tennis, April 12 in Jamestown. Greeneview’s Matt Hovan took the Ohio Heritage Conference’s 2017 Player of the Year Ben Heath three sets before falling, at No. 1 singles, April 12 in Jamestown. 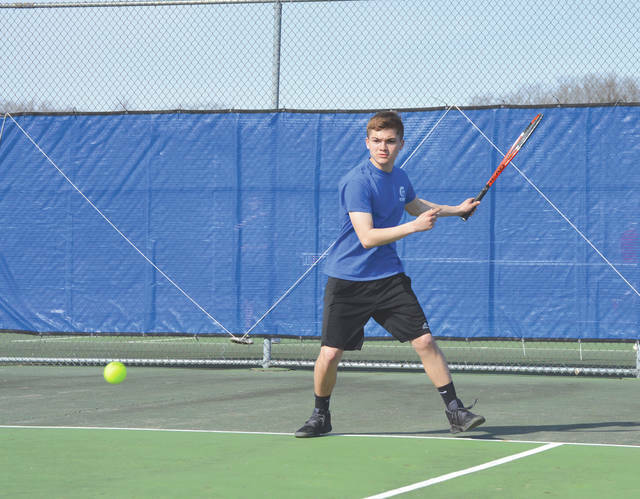 JAMESTOWN — Visiting Cedarville came away with a 3-2 boys high school tennis team win April 12 at Seaman Park, but the host Greeneview Rams made them earn it. 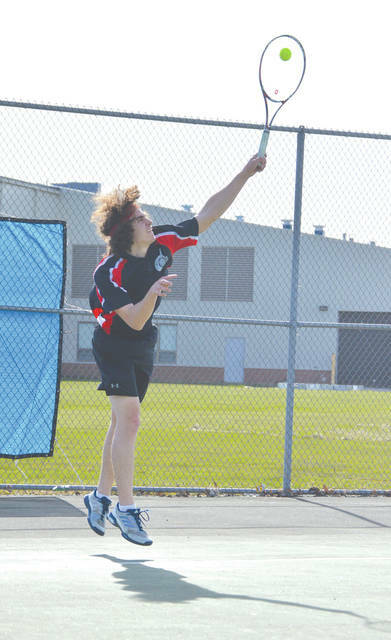 Three of the five matches went three sets, and Greeneview claimed two of those, on a sunny but very windy Thursday afternoon. The Rams Matt Hovan surprised everyone by claiming a relatively quick 6-1 win in the first set against Cedarville’s 2017 Ohio Heritage Conference Player of the Year, Ben Heath. The Cedarville Indian rallied to win the next two sets 6-3, 6-2 to take the No. 1 singles win. Cedarville’s Colton Lewis took the No. 2 singles win over the Rams’ Darian England 6-0, 6-0, then Jate Bradley won at No. 3 6-2, 6-1 over Greeneview’s Lane Hilderbrand to give the Indians a 3-0 lead, clinching the team match. But Greeneview’s doubles teams both claimed three-set wins to keep the match respectable. In a battle of lefty-righty combos at first doubles, the Rams tandem of Mason Link-Hunter Grim won a 7-6 tiebreaker (8-6), lost the second set 6-2 to Cedarville’s Nick Shaw and Ethan Leisure, then took the third set 6-2. Greeneview’s second doubles duo of Moldova exchange student Emil Neer and Grant Callaway lost their opening set 6-4 to Cedarville’s Emeline Reed-Noah Myers twosome, but claimed the next two sets 6-3, 6-4 to grab a match win. Cedarville ups its overall record to 3-2 (1-1 in the OHC) with the win while Greenview continues to improve but remains winless at 0-7 (0-3 OHC). Greeneview coach Troy Terrill was just as proud of how his Rams players performed, despite the loss. He was especially impressed with how Hovan battled with Cedarville’s Heath. 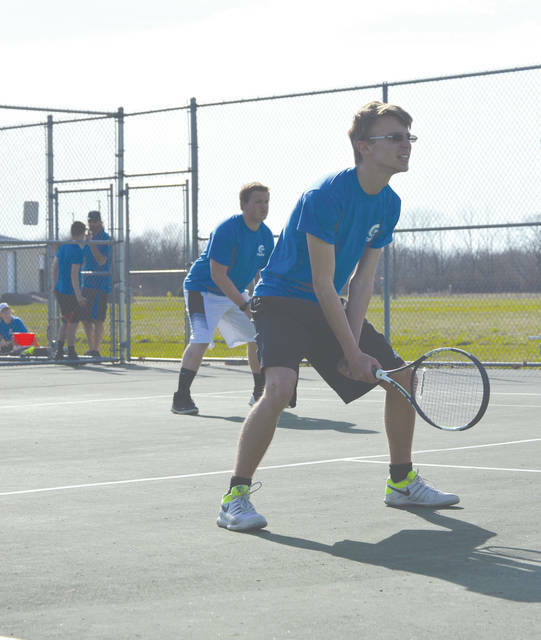 Greeneview returns to the Seaman Park tennis courts on Monday April 16 for an OHC match with West Jefferson. The match with West Jeff is the first of four scheduled Rams matches next week. They play on the road Tuesday April 17 at Carroll, April 18 at home with Northeastern, then they end the week at Dayton Christian on April 19. Cedarville returns to the Cedarville University tennis courts for a trio of matches next week, starting Monday, April 16 against Greenon. They Indians then have scheduled matches April 17 at home against Kenton Ridge, then April 18 with Catholic Central.